Officials say the focus is just on deepening economic ties. Chinese Premier Li Keqiang and Prime Minister Justin Trudeau talk at the Great Hall of the People in Beijing on Aug. 31, 2016. OTTAWA — As Prime Minister Justin Trudeau prepares to travel to China next week, officials say Canada is still contemplating the challenges associated with pursuing a free trade deal between the two countries. The prime minister leaves Saturday for his four-day trip — a return visit that at least one analyst says is shaping up to be a very "ordinary" excursion. "There are a number of considerations still to be had. The government is weighing the challenges and opportunities," a government official who briefed journalists on Friday said when asked about the possibility of Trudeau launching trade talks in Beijing. The officials, speaking on condition of anonymity in accordance with the terms of Friday's briefing, say the focus of the trip will be deepening economic ties and attracting more Chinese investment to Canada. Trudeau will meet Monday with Chinese Premier Xi Jingang and will also have meetings with senior Canadian and Chinese executives. 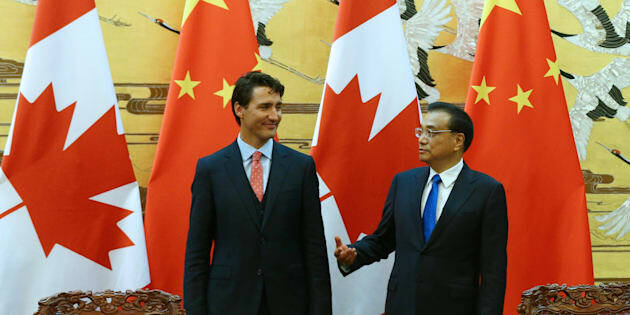 China is anxious to start formal free trade talks after several rounds of exploratory discussions, but Canada is still assessing its position, officials say. The government recently released the results of consultations with more than 600 businesses, academics and civil society groups. Some of those surveyed said a pact with China could kill Canadian jobs, including in manufacturing, and reduce the ability to compete against lax labour standards, lower environmental requirements and Chinese state subsidies. "The trip has to be understood as an ordinary trip in extraordinary times," said Paul Evans of the Institute of Asian Research at the University of British Columbia. Evans said Canada is likely biding its time amid the ongoing renegotiation of the North American Free Trade Agreement, which reached an impasse earlier this fall when the United States tabled a series of proposals that Canada and Mexico deemed untenable. "Canada will try and tread water for a little time longer," while the Chinese will be "increasingly frustrated on this," Evans said. In announcing the trip earlier this week, Trudeau's office made no mention of free trade, and government officials have said no decision has been made on whether to pursue such negotiations. "A strong relationship with China is essential to creating jobs, strengthening the middle class, and growing the Canadian economy," Trudeau said in statement. "I look forward to meeting again with China's leaders to strengthen our relationship and set the stage for even greater trade and investment co-operation." Canada intends to continue frank dialogue with China on topics like human rights and good governance, the statement said.